American Football never meant to be legendary. The Urbana, Illinois trio—comprised of guitarists Mike Kinsella and Steve Holmes and drummer Steve Lamos—recorded one self-titled album in 1999, played a handful of tour dates and called it quits less than a year later. 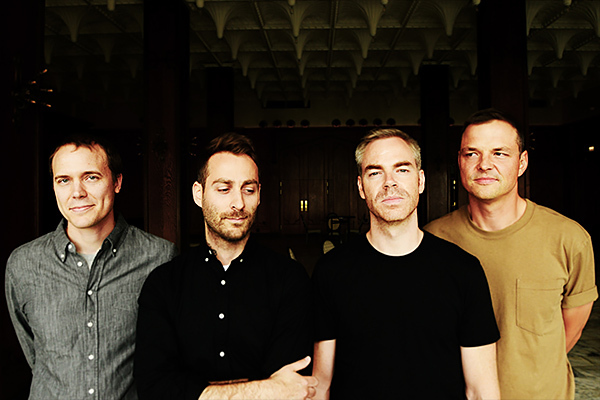 As the members of American Football moved on to other projects, most notably Kinsella with his long-running project Owen, their sole album quietly grew in reputation among many people attuned to the independent underground and college radio circuit, eventually becoming critically and popularly regarded as a classic millennial indie-rock album, a distinct hybrid of math-rock and emo. At the time, its earnest lyrics and intricate instrumentation were an unlikely combination, but the group’s influence and effect continues to be audible, particularly in contemporary bands falling under the loose category of “emo revival.” To mark its 15th anniversary, Polyvinyl Records reissued American Football’s debut album, and the band played their first shows since 2000, accompanied by bassist Nate Kinsella, Mike’s cousin. While American Football’s reunion began as a way to revisit their songs live, the tour has also generated the group’s first new music in 17 years. On their long-awaited second album, which is also self-titled, the band returns to the graceful ambience and complicated construction of their debut, rounding it out with a newfound rhythmic sensibility. We spoke to Nate Kinsella about the process of writing American Football’s first new music in more than a decade, performance anxiety, and maintaining an aesthetic after a long absence. Did you start playing again with the intent of making new music, or did that come later in the process? That came later. I think it was brought up probably after the first New York shows, just kind of casually, just wondering, ‘What if we did that? What would that be like? How would it be received?’ But we didn’t really talk seriously about it until a year into the reunion shows. I think there was a finite amount of shows we could play with just the nine songs we had, and we wanted to keep it going. One way to do that was just to write more songs. The first album was self-titled, as is the new one—was that decision intended as a way to connect the two albums? I think it’s a way to sort of stick with the motif, I guess. Naming the album actually seemed like it’d be a lot of pressure. With the name of an album, you’re sort of boiling the essence down. The album title sort of captures the overall feeling. I think that leaving it self-titled, or untitled, felt appropriate because the first one was untitled. It took a lot of pressure off to try to make a statement. Just sort of sticking with that form of ‘untitled album’ seemed like a safe approach. Also, the artwork is tied into the old album, too. So it’s an answer to the first album in a way—or at least a comment on it. They’re coming from the same people at least. Is the house on the cover the same one that’s on the debut? Yeah, it’s the same one. I always liked the photo. I think it fits with the feeling of the first album. It created a narrative without spelling anything out in particular. I think it’s a really cool thing that happened. It kind of became an iconic thing. There’s memes online now of pictures of houses and people using the font to make it look like the American Football album cover. It’s like a cultural object that people recognize. We were trying to figure out what to do with the new album, and one idea we had was going back to the house and looking at it from the inside and sort of revealing what was on the inside of the house. People would be intrigued to see that, because when you’re creating more songs—and that’s what we’re doing, creating more and putting more out there—it seemed to tie in, in a nice way. Was it important, in writing the album, to create something that continued what the band had started in 1999? We didn’t really think about what it should or shouldn’t sound like in specifics. We were just throwing it all out there in bits and pieces and everyone was contributing. And once we got a healthy pile of things, we cherry-picked what sounded the best to us. I think if you get, especially those three guys [Mike Kinsella, Holmes, and Lamos playing together] it just sounds like American Football. It’s a funny mixture of playing styles that sort of creates this thing, organically. So there wasn’t a whole lot of planning or trying to second-guess or reflect or sort of curate what our impulses were. We just made it. It seemed very natural. How did you end up joining the band? Mike’s my cousin, and we’ve played together in a bunch of different projects. We began playing together in 2003—we were in Joan of Arc together. And I helped mix some Owen songs for him along the way. And when they decided to do the American Football reunion shows, it wasn’t on my radar at all. I didn’t know the reissue was happening. He emailed me to ask if I wanted to play bass in American Football, and I said ‘There’s no bass in American Football, so I don’t know what I’d be doing.’ That’s sort of how I got invited to play. So I learned all the old songs, which I already knew. I knew how they went. I was a fan years ago, when that album came out. So it was fun to go back and revisit all those songs and replay them. In the years since the first album was released, it became one of Polyvinyl’s biggest sellers, even though there was very little touring or promotion behind it. Did that catch everyone in the band off guard? Yeah, I think it did surprise everyone. And it continues to surprise everyone. Even with all the reactions from the reunion shows. I was a fan when it came out. And all my friends were into it, too. Because they never really played out that much, they never got to see that people were really into it. They’d just get updates from Polyvinyl, just over the years there was a steady increase of people being interested. So yeah, it’s a surprise to everyone, for sure. What other surprises were there when you first embarked on the reunion tour? The venues were really big. And people were really psyched. Obviously there wouldn’t be a mosh pit or anything, but I didn’t expect so much positivity. Everyone was just radiating joy. It was really amazing. That part I didn’t expect, and those are the biggest shows I’ve ever played. I didn’t know what to expect at all. I didn’t know what to compare it to. I didn’t expect how warm the reception would be. In the beginning we were kind of bungling through stuff. It took a while for us to get enough confidence in ourselves. It took us a while to get used to things and learn how to get through it without freaking out. I was shaking at those first few shows. I was so nervous. But now, we’ve done enough where it’s not that big of a deal anymore. This entry was written by Editorial, posted on October 18, 2016 at 10:13 am, filed under featured music and tagged American Football, Emo, Indie, Mike Kinsella. Bookmark the permalink. Follow any comments here with the RSS feed for this post. Post a comment or leave a trackback: Trackback URL.